This twin-rotor helicopter included an MG 15 machine gun and two 551-pound (250-kilogram) bombs, a rescue winch and cradle, a reconnaissance camera, and a 106-gallon (300-liter) auxiliary fuel tank that could be jettisoned. It was powered by one 1,000-horsepower (746-kilowatt) radial piston engine and could reach a maximum speed of 109 miles per hour (175 kilometers per hour). Each rotor was 39 feet (12 meters) in diameter. 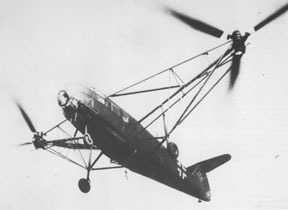 The helicopter was 39 feet (12 meters) long and 14 feet (4 meters) in height.